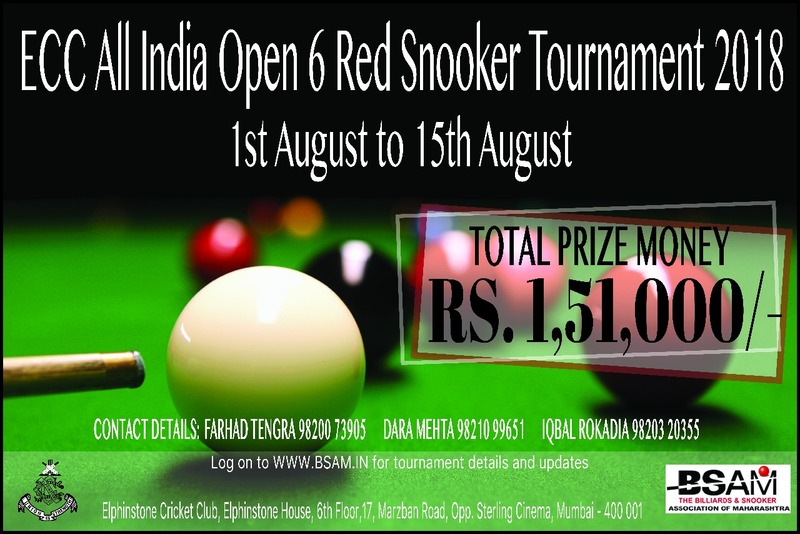 ECC All India Open 6 Red Snooker Tournament 2018. • Entry fee Rs. 1000/-. A players participation will only be confirmed on receipt of his/her entry fees. This version is played with SIX number of red balls. All the draws and the match schedules will be put up on the website www.bsam.in well in advance. The draws will also be put up at the ECC . All participants must check the website for their schedule match time and date well in advance. All participants must report for their match 15 minutes before their scheduled time. No participant will be notified of their matches... they need to CHECK the same on the above website.Matches once scheduled will NOT be adjusted. ALL PARTICIPANTS ARE REQUESTED TO PLAY IN THE SPIRIT OF THE GAME. STRICT ACTION WILL BE TAKEN AGAINST THE PARTICIPANT WHO DISRESPECTS HIS OPPONENT OR THE GAME IN ANY WAY.